My sisters were raving about this new burger joint near our place and since it was a Sunday (and diet cheat day! ), we went to BG Burgers at Pallocan East for our merienda/dinner. It's not too hard to find while you're commuting and most trike drivers at Don Ramos know the place already. It's 500m past Greenwoods Subdivision and located at the left side of the road. When you get there, it looks like a house with a party inside. 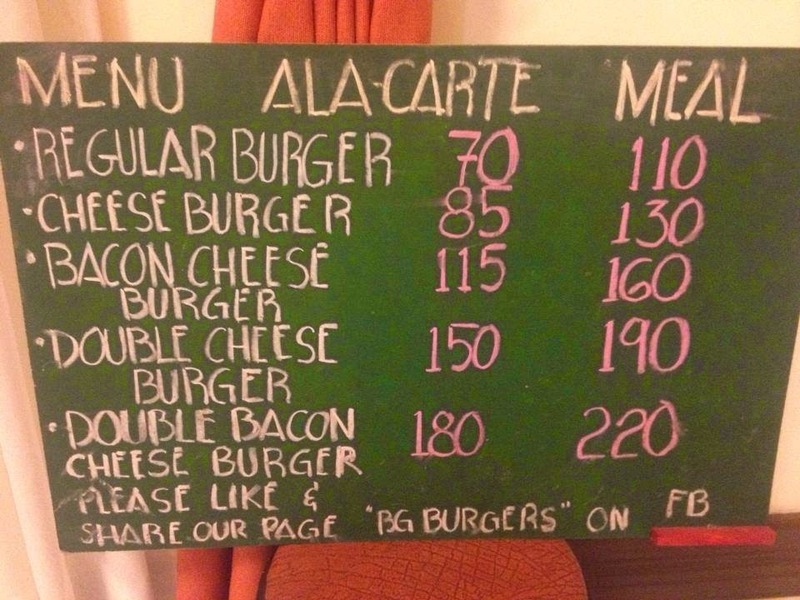 The menu is pretty straight-forward since they just have burgers (that can be ala carte or a value meal with ice tea). The place was packed considering that it was just 4:00PM and the place opens at 3:00PM. "This place must serve good burgers," I thought. Being out of route from the malls and the city proper and all these people going there just to eat was a sign that I'm up for a good meal. Considering the price of the food, this was definitely value for money. The patties were not greasy. The iced tea that came with the burgers were brewed and not the instant ones. The fries were not greasy as well. Eating it in a house lawn also felt like I was just having some merienda at home with my sisters and I liked how it's a no-fuss fast food place. I'm really happy that my hometown Batangas City is gradually having more choices of good foodie places apart from the usual fast food / casual dining places. And if you're up for a food trip there, BG Burger is a good place to grab a great meal!